I recently took apart our Autohelm – now Raymarine – Type 2 Linear Drive Autopilot to diagnose and correct a reoccurring issue we were having over the summer. Before starting to take it apart, I was a bit terrified of how complicated the thing would be on the inside and, ultimately, whether I would be able to get it back together, let alone fix it. But eventually I embraced the task, knowing I did not want to go through another summer worrying about whether our autopilot would continue to work and, if it broke, whether I would be able to fix it. The insides of the unit turned out to be a lot simpler than I had imagined, though I will not be certain I fixed the problem until we spend some time with the pilot on while underway. Knowing how many people have these units, how complicated they appear to be, and how little information on them that is out there, I shot a video of me reassembling the unit, which should familiarize anyone who is interested with the insides of a linear drive autopilot. I also figured I would relate my experiences here and point to the Autohelm diagram that I found essential. Last summer, we had two distinct problems with our Autohlem. First, on our way down from Sandy Hook to Cape May, our ball actuator joint sheared off. Fixing that was just a matter of finding, ordering, and then screwing in the new part. Our second issue was a little more nebulous and a lot more difficult to troubleshoot effectively. While running from a storm on the Magothy River, we encountered some problems with our steering after having just turned off the autopilot. The steering would work to starboard, but catch while turning to port, making it difficult to go left, but, more significantly, worrying us about the future of our autopilot and the potential for more serious steering issues. The same glitch reoccurred from time to time the rest of the summer, always immediately after we had switched off our pilot after a long haul. And once, while making the 60 mile trip from St. Michaels to Solomons, the autopilot just stopped working after steering us off course, presumably for the same reason (it definitely was not a compass or computer problem). In St. Michaels, I had spent some time researching our problem and tried to take the unit apart. A pesky metal circlip (c-clip, snap ring, Jesus clip) kept me from getting at the innards that time, but it was at that point I decided I would disassemble the Autohelm this winter when I had space, time, and access to stores. And that is exactly what I finally got around to doing this past week. Thinking I needed a special tool to open the circlip, I hunted around town at the auto parts, hardware, and, even, sewing stores. While I could find various tools for circlips, none of them had prongs narrow enough to fit in the tiny circlip on the Autohelm. I then spent about fifteen minutes trying to sort of pry it off, which eventually worked. If anyone knows where I can find a pair of snap ring pliers with very small prongs (about the size of a standard needle), please let me know. After successfully opening the circlip, I was able to access a good deal more of the unit. However, I also had to remove some more screws and two roll pins to expose and take apart the entire autopilot. To get the roll pins out, I just supported the shaft of the unit with a piece of wood and used a punch and hammer to knock the pin out. You can see exactly what I am talking about in the video. Our Autohelm had a broken roll pin (#22 on the diagram) on the very inside of the unit. I doubted that was the source of our problem, though, because the broken pieces seemed secure inside of the hole. Moreover, I thought I could have snapped the pin myself when I was removing it. Without any other obvious issues with the unit, I decided to call Raymarine’s technical support line, which I had read rave reviews about online. On the first attempt, they had me leave a voicemail because they were too busy assisting other customers. The recording told me they would call back within 10 business hours. After they failed to return my call by the end of the next day, I gave them another call. This time, I spoke to a real person who was also quite competent. We talked over the symptoms and discussed the inner workings of the unit. He seemed to think the broken pin could have been my problem, saying that the pin would probably not fall out, but a piece of it might have been extending out the side occasionally, obstructing the proper movement of the arm. Though I was not completely satisfied with the explanation, we could find no other issue with the unit. So, I went to Fastenal to get replacement stainless steel roll pins of the proper size. It was my first trip to Fastenal, and I left wondering how I could have never been there before. If you are not familiar with the store, it is a fastener super center focused on customer service with outlets across the States. They did not have the odd metric roll pin in stock, but were able to order them to be delivered the next day. Once I got the new pin, putting the autopilot back together was a breeze, except the pesky circlip. But, first, I sprayed the entire arm – as the Raymarine tech suggested – with a graphite lubricant. Check out the video to see for yourself. Linear drive autopilots, at least our Autohelm Type 2, is a relatively simple piece of kit, and I am fully capable of taking it apart and replacing parts. Replacement parts are all available from Raymarine, though they are a bit expensive. We will definitely be buying spares before we go on any major trips. In fact, we probably should buy some spares for this summer, so that we can have them in case we run into another problem with the unit on an overnight passage or, for that matter, any time at all. The unit seems more or less bullet proof as long as you don’t bend the arm. With some spare parts and graphite, it seems like these things could run for ever. I hope that ends up being the case. Hi, I also had a “pin” break..middle of Gulf Mexico, night , squall, etc., except my pin was the one connecting ram to rudder quadrant. Because it was interfering with the rudder, I un-screwed the end fitting & must have screwed the ram off the screw drive. Short story is mechanic says that’s only fixable at factory. Did you by any chance take that end cap off? and if so, what about the bearings inside that run in the screw groove? I am a bit confused as to what broke. On our autopilot, the end of the ram/arm has the actuator ball joint (see our post on that) screwed into it. We can replace this ourselves just by screwing and unscrewing it by hand. 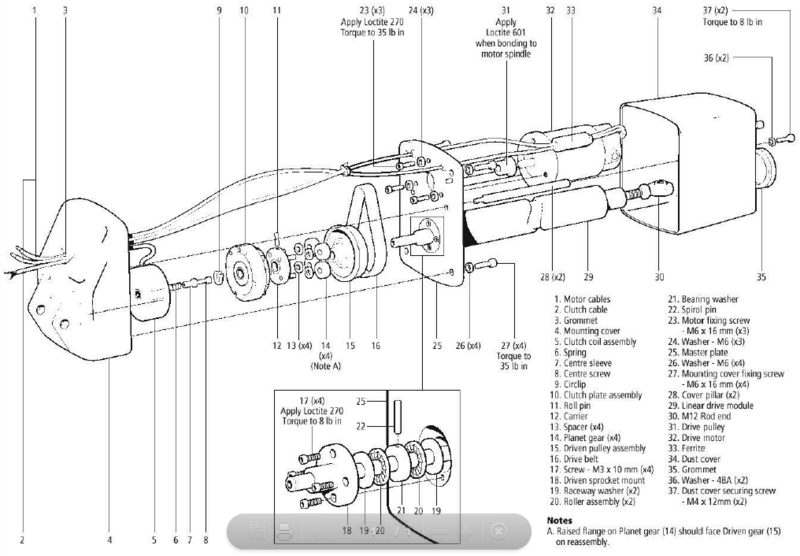 Then there is a pin that goes through the ball joint attaching the ram – by way of the joint – to the rudder quadrant. The pin is just a simple metric clevis pin. Was it one of these things that broke? Or is there something else inside the arm that I don’t know about? 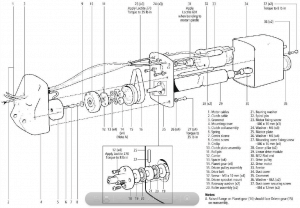 I guess the other possibility might be that the ball actuator joint sheared off inside of the arm, leaving part of the threaded portion inside the arm. In that case, I imagine you might be able to use a reverse bit to drill into the remainder of the threaded portion and get it out that way. I would love to hear more details. And please share some photos if you have them. Hi Jeff, thank you for the video. I’m just about to remove my type 2 linear drive on my Moody 376 to give an it overhaul as I’ve experienced it stopping and ‘DRIVE STOPPED’ message appearing on the ST6002. Having seen your video I know that one of the cables must be fractured where it enters the mounting cove, as it starts working when I move the cables near the cover. There is constant movement of these cables when the drive is operating has work-hardened the copper, causing it to fracture. I will make a video of the work and post it on the Moody Owners Association web site. As to the cir clip pliers, I’ve see the tips of a pair of these pliers ground down to a size that would remove these small cir clips. Carsten here … Great video regarding the Raymarine linear drive. I have a type 1 that is getting louder and louder so I probably will take it apart very soon. Did you remove the ‘linear drive module’ completely too? I somewhere read that there are 52 or so balls around ‘the drive / thread’? I, too, have heard rumors about all the balls in the drive. I never saw them or took them apart as I only stripped down the unit to the point shown in the video. I would love to hear about what you found in there if you do take it apart to that point. Stripping down the autopilot as I did seems to have solved our problems with the noise and strain the unit seemed to be under. In fact, we just did a 20-hour overnight in which the autopilot steered continuously for about 18 of those hours. Let us know what your experiences are taking your unit apart. Good luck with it all. Thank you for the great video. I have a Autohelm 5000 with a linear drive that is acting up. When I turn it on at the dock and turn the electronic a bit to simulate heading, I can hear the linear drive trying correct from either directions. 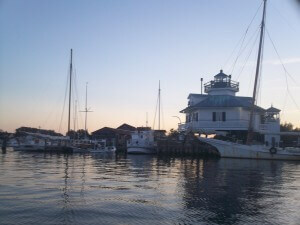 But when I am sailing, it does not keep the heading and end up doing full circle. Not too sure what the problem might be. I just purchase the boat that came with it. if anybody has any idea, please let me know. Sorry we did not get back sooner. We are up in Maine at the moment and have poor access to internet. If your AP really goes in a full circle, I have no idea. However, if it starts to go off radically in the wrong direction, it may be that your wires are just reversed; the AP just changes the positive and negative to get the boat to steer in different directions. Without knowing more, I do not have too much else to offer. But the very fact that you are getting some movement strongly suggests that you can get the thing working again. I recommend getting in touch with the Raymarine tech support folks; they have been very helpful to me, though it has often taken a few days and more than one phone call to actually get them to call back. Feel free to write me more, though I am not sure I will be too much help. Good luck with the AP and the new boat! Hi, I inadvertently took it all apart. It has 69 x 3mm balls in the 2 slots. Putting them back was not to difficult. Make sure everything is shiny bright clean, drop the balls down the one hole and turn the shaft slightly each time till the first one becomes visible in the other side hole, fill the cover with the balls, add some grease to keep them and the other half of the cover in place and put it back and screw it down. Trust that’s clear as mud. I will make a video and post it on youtube. Great article. 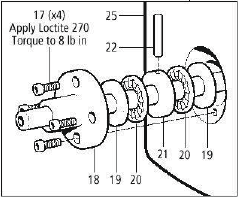 One little detail that would add tremendous value, what were the dimensions of the part you got to replace part 22, the spirol pin? I saw your comment when you originally posted, but I had no idea of the answer. I was just going through a locker and found the spirol/spring pin spares that I bought with the replacement we used. It is a M3 x 14mm SS spring pin. We sourced them from Fastenal, but I am sure they are available from a wide array of shops. Good luck! I know that I used a graphite spray. Whether that was the recommended lubricant or not, I can no longer remember. But it has certainly worked! I too have been having issues. I am delivering a boat with an old autohelm 6000 linear drive. I took the drive off of the quadrant and it does the same as when installed. When I turn on the autopilot it will turn to port, but if you try adjusting to starboard it locks up, goes nowhere AND won’t let you go into standby. I have to turn off the breaker at the panel to reset. Any attempt causes the same thing. Since this happens from the nav. station or the helm I am assuming it is a problem with the drive, but I’m nervous that it could be the computer or head units and I’m wasting my time. Stuck in Fort Pierce. ahhh. boats. I am in the process of ordering an old replacement I found on ebay for replacement or at least parts. Hi John, reply to John Little comment 15/11 2017. Did you ever make the video of replacing the ball bearings in the screw thread of the linear drive. Has anyone else video if servicing this part(screw thread/ ball bearings) of the auto helm type 1 units. I can’t find anything online or you tube.